Aaron Long: How did SCALES & SCOUNDRELS come to be? How long have you two been developing this series? Sebastian Girner: Galaad and I started talking about working together around November of 2015, so it’s been almost two years. Around that time the scripts for Shirtless Bear-Fighter! were just about finished, so I’d been looking to get into another writing project. I had a couple things I was picking away at, but nothing with an artist attached. 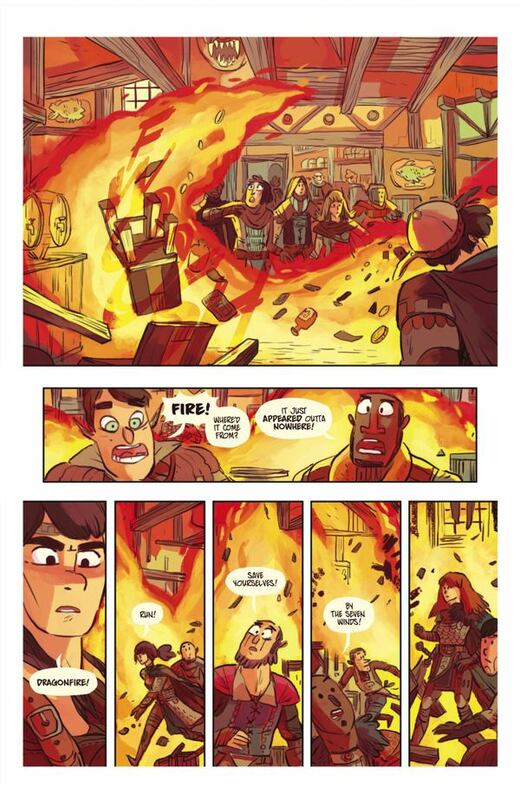 So when Galaad emailed me out of the blue and we got talking, it was literally a dream coming true: here was a brilliant young artist, with a unique style and a real desire to make comics, and we clicked immediately on that level I’ve often heard other creators talk about. When we brought designer and letterer Jeff Powell on board about a year ago, it all just fell into place perfectly. I honestly can’t believe it’s been this long since I’ve been having too much fun to notice. Galaad: Two years already! When we started working together, we put everything we had, all our hopes and dreams for SCALES & SCOUNDRELS, in a document, with everything detailed from the origins of the world to the different places and people who inhabit it. Then, we chose to take a small slice of this world and tell the adventure of a small party of people going down a dungeon – with a twist. That first big arc was actually the perfect warm-up. 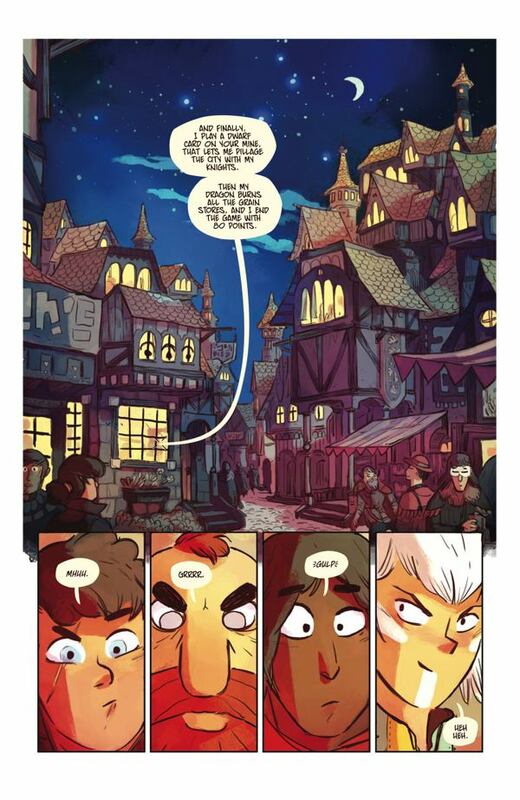 As we draw close to finishing it (we’ll have the whole arc done before shipping the first issue), I realize it was the ideal setting to get to know our characters. When we get out of there, we have a whole world to explore and an infinite number of adventures that can be told, including our main character’s overarching story. Taking our time to gradually add layers upon layers of personality to our characters, instead of dumping tons of world building in the first issue, was the most brilliant idea Sebastian ever had. In issue 8, we’ll hit the ground running, and you’ll get a glimpse at the size and scope of our world as it opens up! AL: What drew you both to the fantasy genre? G: Personally, I was introduced to fantasy by Tolkien and Zelda as a kid. To this day, I have been drawn to the lighter side of fantasy, not the tall heroes with the big swords and the big muscles, but the wondrous sense of excitement you get when exploring a new dungeon or fleeing an elven fortress on a barrel. 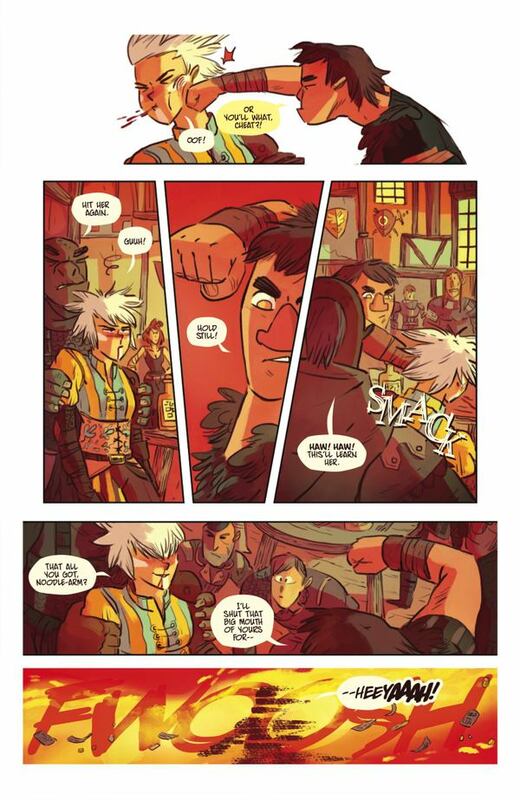 SCALES & SCOUNDRELS is a counterpoint to that kind of fantasy that’s so drab and serious. We want to put the fun and colours back in the genre. SG: I grew up reading a lot of German YA fantasy novels, that was a popular genre in the 80s, especially books by author duo Wolfgang and Heike Hohlbein. I also really dug fantasy comics, from classic Conan to french series like The Quest for the Bird of Time. And of course, I devoured Tolkien every summer for a few of my teen years and even punched my way through the Silmarillion once, which is more than enough, I think. I love exploration and adventure stories, diving into the unknown and challenging what you thought you knew. Fantasy is great at that, and I also just love monsters and weird beasts, so there’s that too! AL: What is the world of SCALES & SCOUNDRELS like? Are we talking Dragons, Elves and the full gamut? SG: You’ll definitely be seeing some classic fantasy creatures pop up in the book. Orcs, goblins, a stray elf here and there. One of our core cast of characters is actually a plucky young dwarf named Dorma Ironweed, and she’s probably my personal favorite! So while you may see some familiar pointy ears and a big braided beard or two, how these characters and races interact with each other will be very different from anything we’ve seen before. We’ll be creating our own creatures, myths and customs to tell new and unique stories. We’re not going to have one of those “everyone gangs up on the orcs!” kind of climax. 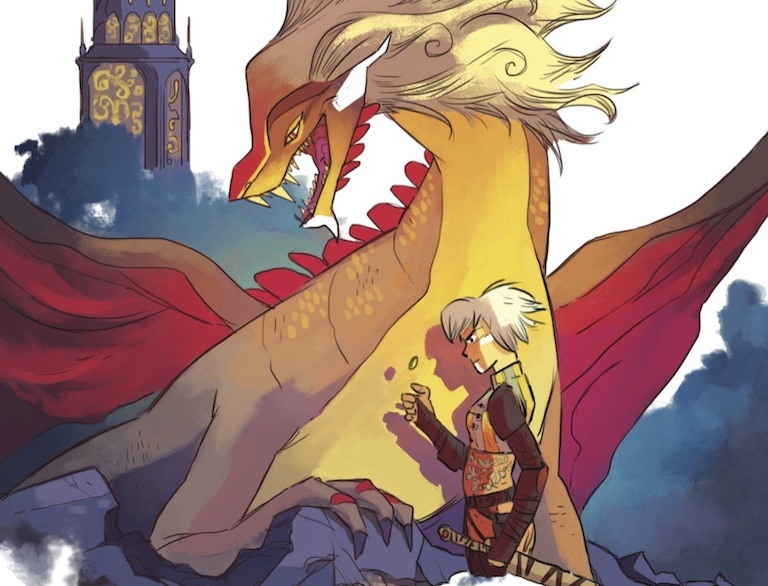 AL: What can you tell me about SCALES & SCOUNDRELS’ spunky heroine? SG: Luvander (or just ‘Lu’ for short) is my favorite kind of heroine. Quick to action, fast-talking, loud-laughing, steps up and doesn’t back down, gets into trouble more often than out of it. Just a character full of fire and pepp and someone I can write any kind of story for, since she’s up for every kind of mischief and adventure. But as is often the case with such energetic powerhouses, there’s something they’re trying to cover up or distract from, an underlying melancholy that weighs heavy on their heart, and Lu is no different. There’s much more to her than meets the eye, and a lot of the first arc is peeling back those layers and getting a better look at who she really is. She’s not gonna make it easy on us though, a girl likes to keep her secrets sometimes. AL: How did you come to the decision to keep this book accessible to all ages? G: When we started discussing our collaboration, it became clear that Sebastian and I had a lot of common influences. We’re both from European origins, so we grew up with European comics. Mangas are really big there too. When I was a kid, 90% of the cartoons we had on TV were French-Japanese anime. We also played a lot of video games from this era, including JRPGs like Final Fantasy, Dragon Quest or Zelda. There is something unique to those IPs that appeal to both the kid and the grownup in all of us. It’s that kind of magic that we tried to capture. 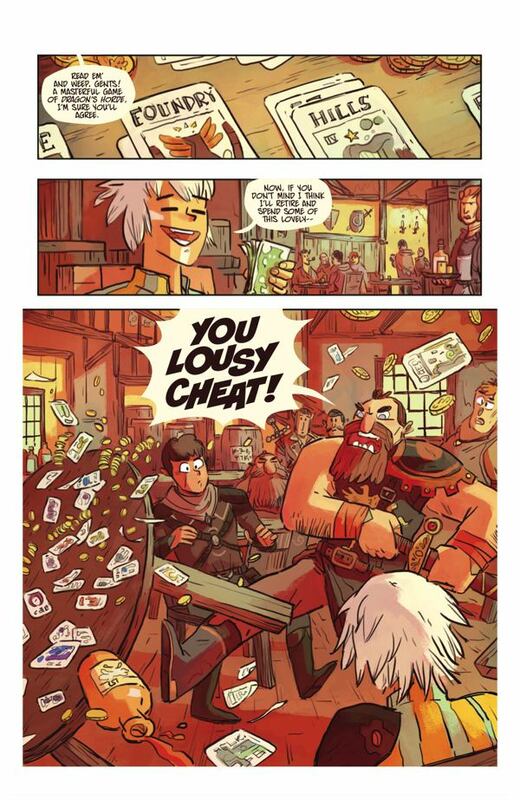 SCALES & SCOUNDRELS is an homage to those series from our youth, but with a modernized take on it. And don’t let the all-ages label fool you. There’s going to be drama, loss, pain and dire times for our heroes. We will explore the boundaries of this genre of comics. 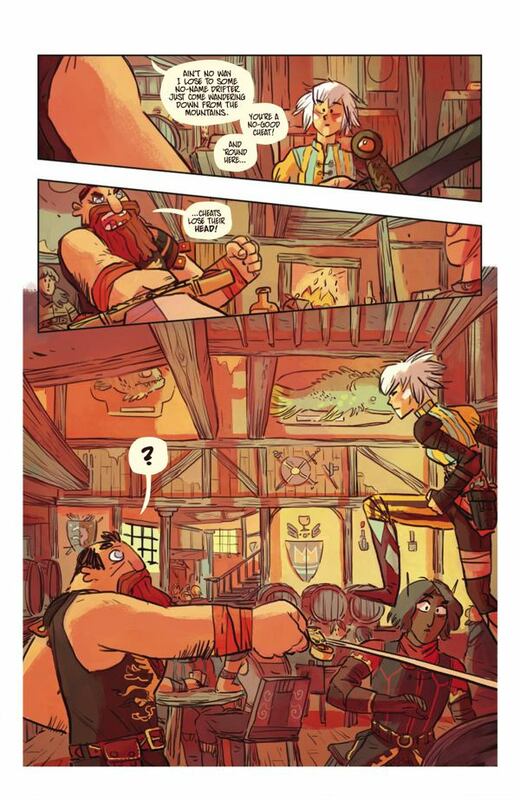 SG: As an editor, I work mainly on mature-content comics (which I love, don’t get me wrong), so in general working on this book with Galaad was a nice change of pace, and a breath of fresh air. We really wanted to challenge ourselves to work within these few boundaries, and craft something that could appeal and draw in readers of all ages and walks of life. It’s that Pixar / Ghibli school of storytelling. Kids love it, but there are some genuinely chilling moments of human drama in those films, crafted in ways that maybe only adults will pick up on. That’s the high watermark of storytelling we’re aiming for. And it’s something I feel that comics in the US really needs more of. AL: Galaad, can you discuss your favourite character designs? G: Lu was the first character that I designed for the series. She went through a few iterations, like the rest of the characters, but the process went very smoothly. I knew she had to have that unruly, scrubby hairstyle, and I wanted her to bear white marks on her face to differentiate her from her human counterparts. In the end, I kept it very simple. The best designs are always the simplest. Look at Indiana Jones for example. His design is so iconic that you can recognize his shadow on a wall. That’s some powerful stuff. What was important to us was to have the characters not be defined by their attire. They change clothes during the adventure. They get dirty, they rip their shirts, they fight, they run, they sweat and they have to change clothes. I generally don’t like the idea of defining a person by his/her looks. Sure, the way you dress is a visible manifestation of your personality, but I don’t like how during the years we’ve equated a character’s persona to his/her exterior appearance. You don’t dress the same for a formal event or an adventure in a dungeon. At the start of the adventure, Aki is still wearing some very formal outfit from his life as a prince. He will lose it very soon, and by the time he gets back into his royal garb he’ll be a very different person. AL: Sebastian, how do you approach writing a script compared to when you’re wearing your editor hat? SG: I take that hat and sit on it. I recklessly flaunt every rule and guideline when writing a script, like I’m thumbing my nose at my later self, who then has to edit the whole mess down to something serviceable. As I still do a lot of editing on other creator-owned books I really want to keep that line from blurring. As an editor your job is to ask questions and suggest answers, but as the writer you need to KNOW the answers (or at least creatively disguise the fact that you don’t) and it’s both scary and incredibly liberating. But more than anything I just love collaborating with Galaad. He’s making me a better writer every day, just by being the artist he is. 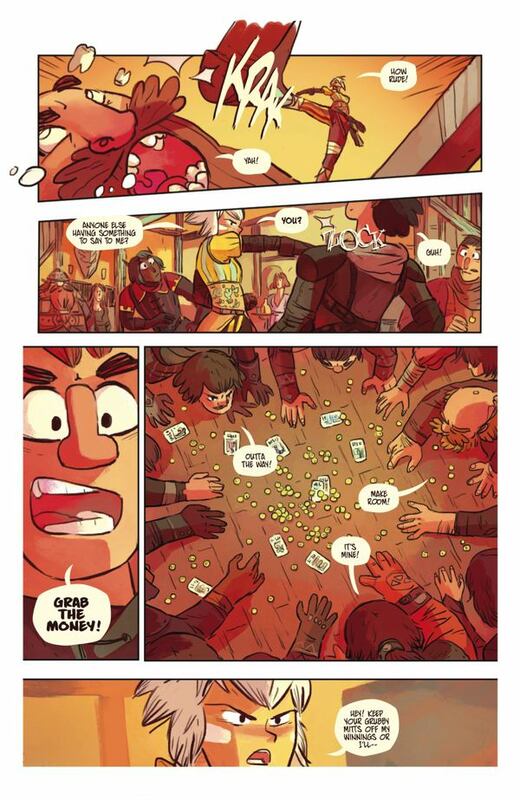 AL: Any final words about SCALES & SCOUNDRELS? G: We’re very excited by this series, the characters and the world they live in. I can’t wait to share it. I hope you embark with us on this adventure, because if everything goes well, we’re in for the long haul! 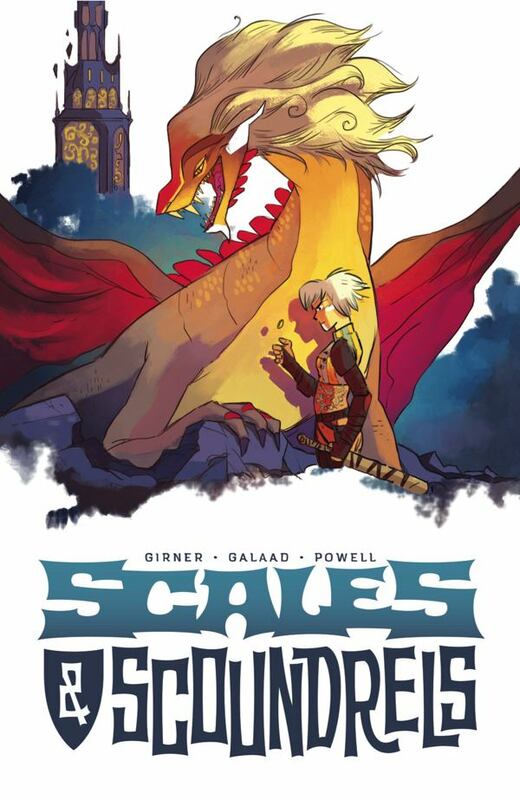 SG: Galaad, Jeff and I couldn’t be more excited to bring you the adventures of Lu and her crew, in SCALES & SCOUNDRELS, coming September 6th from Image Comics! Scales & Scoundrels #1 hits stores on September 6, 2017.